Earn 7 SB per $ when you buy Omaha Steaks gift cards at MyGiftCardsPlus. Omaha Steaks gift cards can be used to shop online, by phone, mail or fax, as well as at any Omaha Steaks retail location. 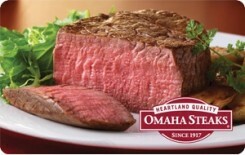 Omaha Steaks manufactures, markets and distributes a wide variety of premium steaks, red meats and other gourmet foods. These products are custom cut and packaged to serve the needs of our various markets. We are a family business and have been since our founding in 1917.